Today begins the advent of treats that I've been planning for all year! Some of you may remember that I did this last year, and the response was pretty awesome so I decided to do it again this year. That means you'll have a new recipe to enjoy each day until December 25th. This year the recipes will range from easy and accessible to creative and unique. Above all, these treats make great gifts! I've always felt that homemade gifts are the best gifts, so I hope you can use these recipes to spread some holiday cheer. 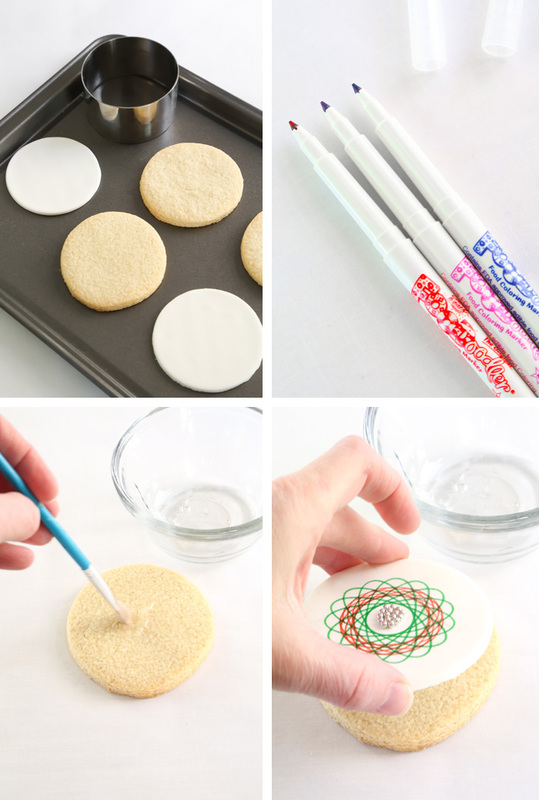 We're kicking things off with these fun and creative Spirograph cookies! Did you ever have a Spirograph as a kid? I did and I loved it! After finding these fine-tipped FooDoodler food color markers, I just knew they'd be fun to use with a spiral drawing tool. I used a 3.5-inch pastry ring to cut out sugar cookie dough rounds but if you don't have one, then the open end of a glass tumbler would also work as a cookie cutter. Use cutters that are at least 3.5 inches or greater, because smaller cookies will be difficult to use with the spiral drawing tool. I used the same pastry ring to cut out circles of white fondant. You'll need to make the fondant circles at least one day ahead of time because they need to dry completely. If these are not completely dry, the tip of the food color pen will sink down into the fondant and the drawing tool will not advance when you try to move it with your pen. You need a smooth, dry surface for the food color pen to glide across easily. 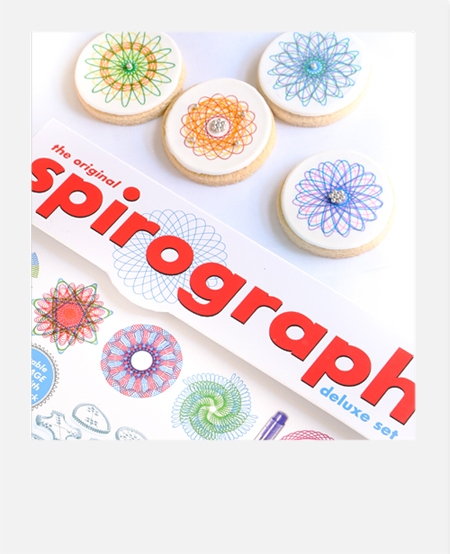 You may want to plan out your designs for the cookies using the pens and paper included in the Spirograph set. I found that the smaller round drawing guides worked best on these cookies, so I suggest giving those a try first. Make extra fondant circles too, just in case you get a little off track or smudge it accidentally (it happens!). 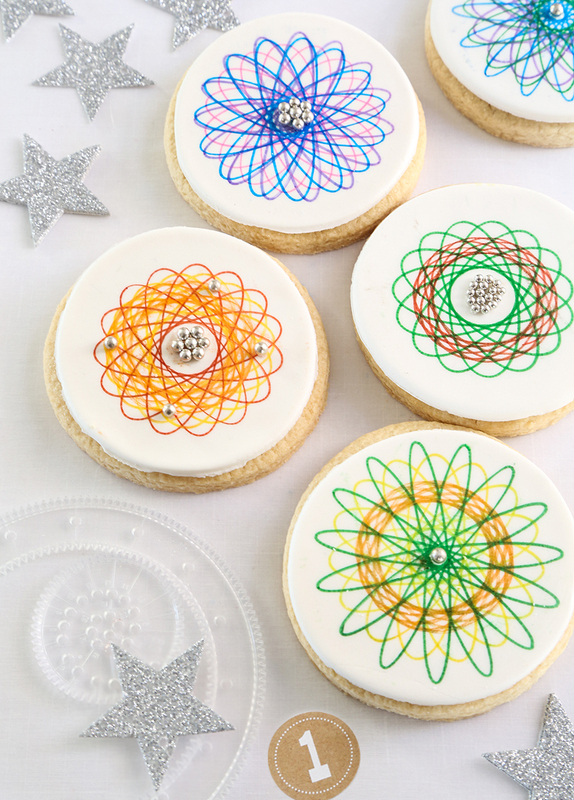 I think these cookies would be so fun to give with a Spirograph set! Seriously, this toy has nothing on those adult coloring books when it comes to stress relief. It's so mesmerizing to watch the patterns appear as you draw. I still love using it! I 'glued' metallic dragees in the centers of the designs using small dots of corn syrup. The motion of the drawing tool causes a little food color smudge right in the center of the spirals and the dragees hide that perfectly. 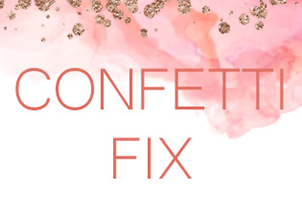 They look glitzy, too. If you don't have dragees, then any kind of sugar pearl or candy could be used - even an M&M! I used corn syrup to attach the fondant circles to the cookies on my first batch, but I used buttercream on my second batch. The buttercream causes the fondant to lose its candy hardness, so the finished cookie is soft and delicious. I highly recommend using buttercream! 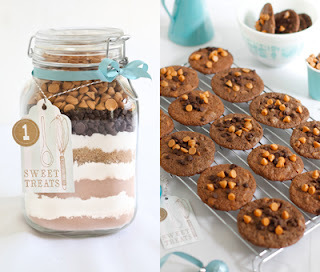 Double Chip Chocolate Cookie Mix in a Jar! Headnote: The fondant circles require at least 24 hours ahead of time, so plan accordingly. 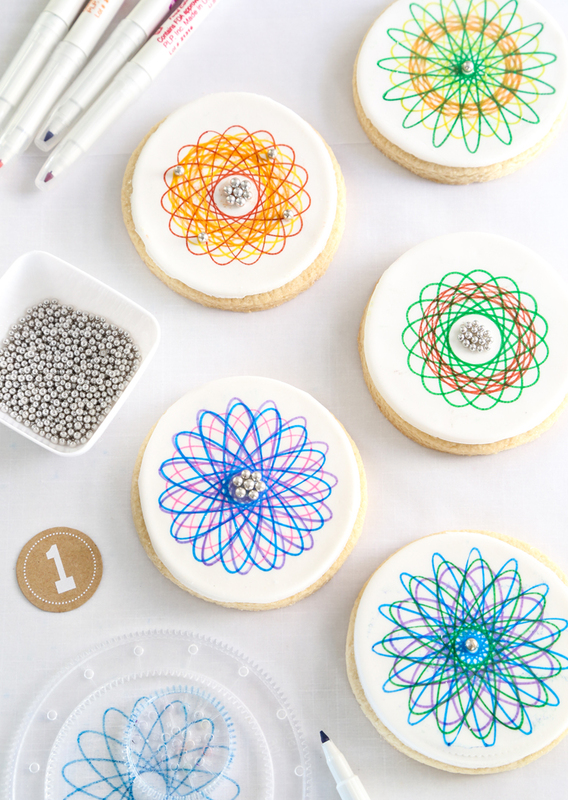 The decoration of these cookies requires the use of a Spirograph drawing tool. These can be found at most discount stores and online. 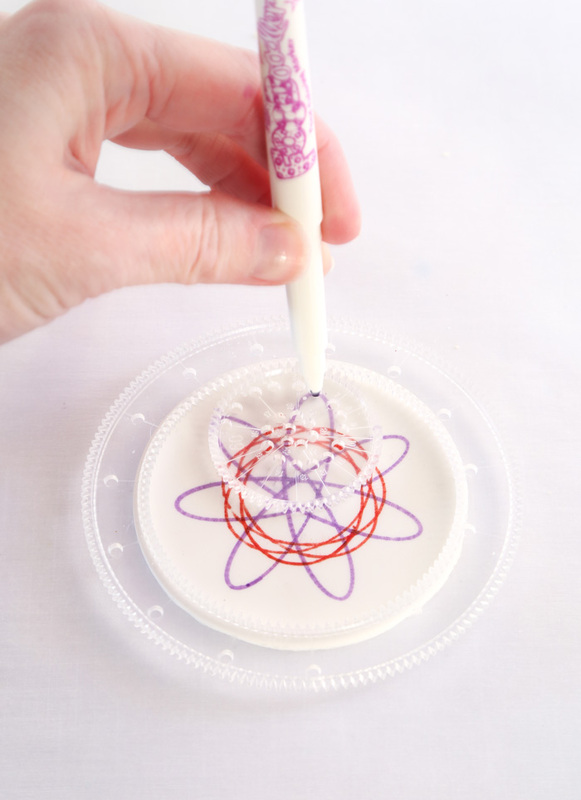 Fine-tipped food color markers work best with a Spirograph. Remove the fondant from the packaging and knead well with your hands for 3-5 minutes. 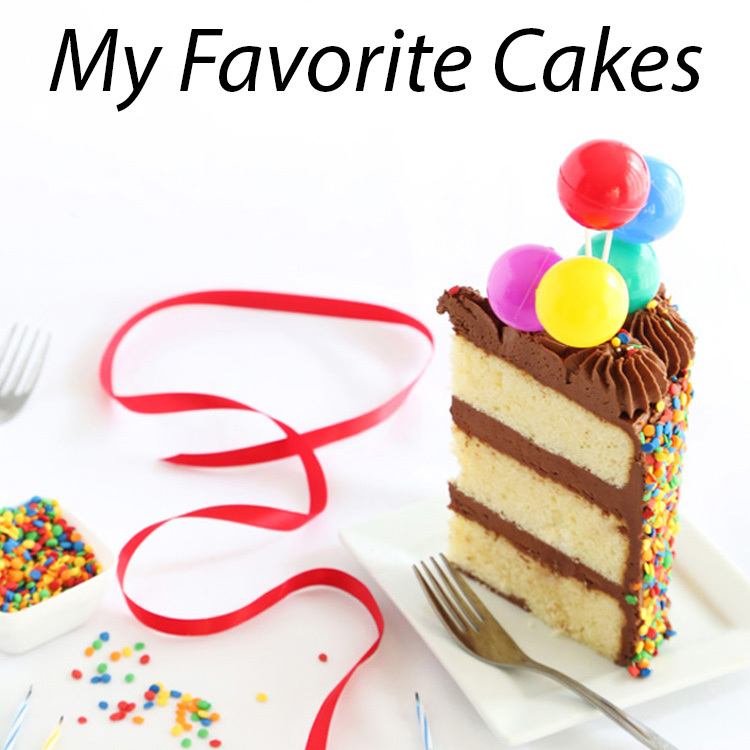 If the fondant sticks to your hands at any time during the kneading, dust it with 1 tablespoon of powdered sugar. Lay a piece of parchment paper out onto a work surface and flatten the fondant slightly. Top with a second piece of parchment and roll to 1/4-inch thickness. Use the cookie cutter to stamp shapes from the fondant. Re-roll scraps and cut more circles. Make more than 24 so you can use some for practicing with the Spirograph tool. Allow the circles to dry on the parchment paper at room temperature for 24 hours. The surfaces should be smooth and dry. In a medium bowl, whisk together the flour and salt. Add to the butter and egg mixture. Mix on low speed until a dough is formed and there are no longer any streaks of butter in the mixing bowl. The dough will often clump around the paddle attachment while being mixed. This is normal and a good sign that your dough is the right consistency. If your mixture does not come together and is crumbly, add ice cold water 1 tbsp. at a time until the dough clumps. Roll the dough flat between sheets of parchment paper and chill until ready for use, at least 30 minutes. Use a 3.5-inch pastry ring or cookie cutter to stamp shapes from the dough and transfer them to the prepared pans. Bake cookies for 12-15 minutes, or until the cookies are lightly brown on the edges. Transfer the cookies to a wire rack to cool completely. 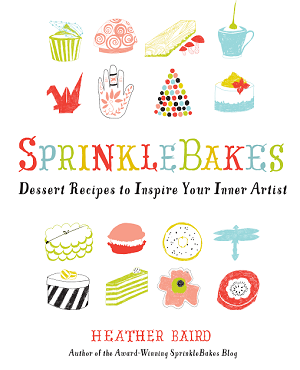 Place the Spirograph ring over a dry fondant circle. Place a small Spirograph circle in the ring to one side so that it fits into the grooved track. Place a food color marker tip into one of the numbered pen holes and use it to move the circle around the track as you draw. Don’t press hard! You just want the top of the pen to lightly glide over the surface. Repeat with other food color pen hues. Let stand until dry, about 1 minute. Cover a cookie with corn syrup or prepared buttercream and set the fondant circle on top. 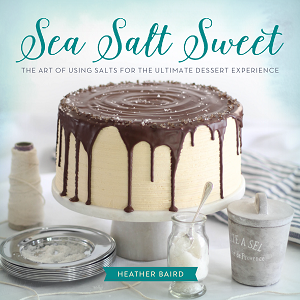 Place a dot of corn syrup in the center of the design and sprinkle on dragees. Use dots of corn syrup to attach dragees to the spiral design, if desired. Repeat process with remaining cookies. Let dry for 1 hour after applying the dragees. 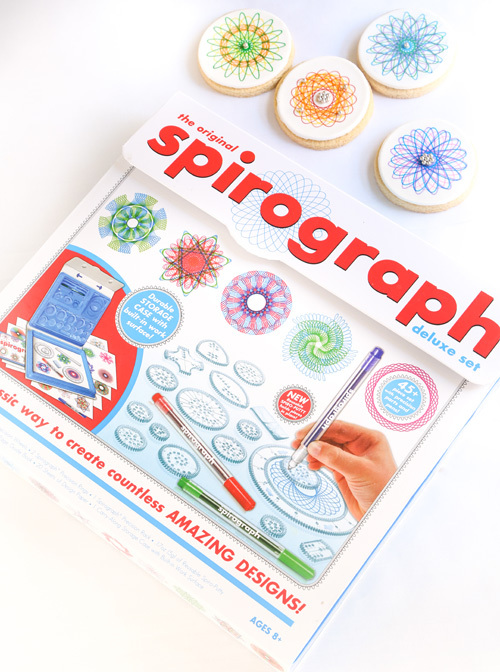 Store cookies in an airtight container, or place them in clear cookie boxes and gift them with a Spirograph set! These cookies look amazing, such a great gifting idea! I love handmade gifts! This is my first comment, although I've followed your blog for some time now. I am always impressed with the creative ideas you come up with. You definitely think outside the box and I love it! What another neat idea! Thanks for sharing! Can't wait to see what's in store for the remaining 24 days until Christmas! As a kid, I loved my Spirograph set! 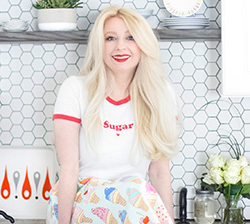 Thank you so much for a blast from the past and an awesome cookie idea! What a fun idea! I used to love playing with those in elementary school! Yippee! I am so glad you're doing this again!!! These are amazing!! And it's funny cause I just bought a spirograph for my mom last week. She's big on coloring mandalas so I thought it'd be the next step. I went out today and bought a spirograph at Michaels. I already own the pens, so I can't wait to try! These are to pretty to eat. You should hang them on the tree! But I am inspired to try this experiment. Thanks for sharing. I think my grandkids have a spirograph. Hmmm?